It's just short of two weeks since Yarndale 2017 took place and I feel like I am finally emerging from the energy crash that typically floors me for a while afterwards. I sat and sifted through all my photographs yesterday, thinking about how truly amazing Yarndale is, and how proud I am to be involved with such a fabulous event. As I'm one of the five folks who make up the Yarndale team, my journey generally begins in January. It takes pretty much nine months of the year to create our two-day festival at the end of September, then another month or so afterwards to wrap it all up and put it to bed. Then we take a well earned break until the following January when we start all over again. One of my favourite jobs is designing and making our mascott sheep which we photograph to use for our postcards and sometimes a little advertising in magazines. I work on this at the start of the year with my friend Carole who is another one of the Yarndale team - she and I both share a love of colour and have very creative souls (Carole is also an exhibitor, we both have quite busy creative lives outside of Yarndale). As you can see from the above picture, the sheep we make are quite large, measuring around 90cm x 120cm. We draw the shape out on a piece of paper to give us an idea of the scale we are working to, then between us we make up the various body/head/leg pieces over a couple months usually. Once all the yarny work is complete, we get a wooden shape cut out at our local builders merchant so that we have a solid template to stretch our woolly fabric around. Over the years since Yarndale started in 2013, we've created a rather gorgeous and eclectic flock of woolly sheep which have become very well loved by our visitors. Our famous canvas sheep bags are hugely popular and usually sell out very quickly each year. We had some extra printed this year so if you would like to gift yourself a gorgeous Granny Sheep bag, we have a small number left in the Yarndale online shop. Much of what I do to prepare for Yarndale is on the creative side, although I am responsible for the social media too. If you have been on the Yarndale Facebook page or Instagram then that's usually my voice you are reading. I also tend to get called on if any general writing is needed - magazine articles, interviews and press releases, plus the content for the brochure, that kind of thing. But without a doubt, it's the creative projects which really get me excited each and every year. For me personally, I feel this is the essence of Yarndale - it's a celebration of yarn, creativity and community and nothing says it better than the colourful decorative elements we bring together for the festival. I started making these giant Mandala Hoops back in 2014, originally just for my own personal amusement before I quickly realised that they would make perfect decorations for Yarndale. I've managed to make a couple of new hoops each year to add to my collection, and have also LOVED that a few of you have made and sent your own mandala hoops to add to mine (I can't tell you how happy this has made me). If you want to read a little more about how I attach my mandalas to the hoops, you can find the blog post here. This is my latest hoop, finished just a week before Yarndale. I used the pattern that I designed for Simply Crochet (more details in this blog post), and I loved how different it looked compared to the soft pastel colours of the original. I had eleven hoops in total this year, which I strung up under the trees at the front of the Auction Mart - they really did look very eye catching. For next year, I'm planning on making a whole lot of smaller ones - I've already got a bunch of these 30cm metal rings and am so excited about trying out some new mandala designs. I was gifted some beautiful cotton yarn by the fabulous Dutch brand Yarn and Colors which will be perfect - the Must Have Minis are the most cutesome little 10g balls which come in 100 different colours (yes, one Hundred! ), check them out at Wool Warehouse, and please do not blame me if you accidentally order yourself some. .....wow!!!!!!!!!!! Isn't that just beautiful?? Inspired by nature and wildlife, the meadow was made from over 250 individual pieces of knitting, crochet, appliqué and sewing. It was created by the same local knitting group who created the canal, with participants ranging in age from 4 to 94. This is such a fantastic example of how wonderful our community is when it comes together to celebrate the joy of creating with yarn. The details in some of the pieces were so inspiring.....just look at that little felted snail leaving it's silvery trail behind it !! We were also really chuffed to see the return of the famous Thirsk Yarnbombers to Yarndale after their creations were enjoyed so much by all our visitors last year. ....and certainly brought about a lot of smiles during Yarndale weekend. And so we come to the Creative Community project which I organise every year - it's my biggest undertaking for Yarndale, and something which I absolutely love doing. I would like to express my deep gratitude to everyone who joined in with this year's Creative Hearts project, it was just soooooo beautiful to see all the hearts come together and was such a powerful representation of how talented, passionate and friendly the crochet and knitting community is. It was a real creative celebration, and it means a huge amount to me to be able to do something like this - I couldn't be more proud of our global crochet community. All in all, we received around 520 hearts for our display - I'm afraid I lost track of the final count as quite a few parcels arrived right at the last minute, but do you know, they came from 21 countries around the world, isn't that something? ❤£1227.46❤ for the mental Health charity Mind. Thank you so very much to everyone who contributed, it means a lot to us to support this worthwhile charity. The hearts are now tucked up safely at Yarndale HQ for a little while, and in the New Year we will start working with our local Mind representatives to see if we can display them or offer them for sale to raise even more money. I'll certainly keep you updated on the ongoing story. From hearts to circles, well one very big, gigantic circle actually. I couldn't chat about our creative crochet community without sharing this incredible piece of work with you. We were thrilled to be able to have this beautiful 14 foot giant mandala on display at Yarndale this year, it really is the most breathtaking piece of crochet I think I've ever seen. It was created by a lady called Hester (@tessafterall on Instagram) as a result of the 365 #zenmandalaproject - the challenge was to crochet one round of a mandala every day for a whole year, which Hester successfully did throughout 2016. I found this image on Google (I'm so sorry I haven't been able to find the source so don't know who this lovely Yarndale visitor is, or who took the photo). I wanted to show you the scale of Hester's awesome Mandala, it just blows my mind looking at it and thinking about all the multiple thousands of stitches and hooky hours that are sitting right there. Hester was super-lovely and very humble with regards to her mandala awesomeness - it was really wonderful to welcome her to Yarndale and for our visitors to be able to chat with her. Oh, there is always so much happening at Yarndale, way too much to mention really, and this year more than ever before we really did have some fabulous things going on. The above photo just captures the spirit of Yarndale perfectly, I love it! We had a return visit from Skipton's Giant Swaledales - these are huge walking puppets created from papier mache, wire and fabric, with a human inside acting out the voice of the sheep...baaaaaaaaaaa!! You can see this sheep is trying out a blanket - this was in the new social area of the festival where among other things (including the fabulous Yarn Doctors) we had a bit of a blanket making session going on, it was fab! Blankets for the Homeless (or BFTH for short) collects knit or crochet 6" squares which are stitched together by a team of volunteers to make colourful blankets for people in need of a little warmth and comfort. Jayne Roper, founder of BFTH, came to Yarndale this year to host a blanket making drop-in where visitors could pull up a chair and join in with knitting/hooking a 6 inch square. It was a fabulous success, and so lovely to think that a little time spent crocheting or knitting with others can help make a difference. And so we come to my own little patch of Yarndale where I spend pretty much all my time during the weekend. Yarndale is a hugely busy festival (we had a record 8,500 visitors this year and just short of 200 exhibitors) and during the course of the two days it is very full on. We usually notice a tiny little lull towards the end of each afternoon but other than that there is barely time to eat or go take a pee throughout the day, it really is that busy. But I do enjoy it so much, it's overwhelming and emotional and joyful and happy and intense, and oh, just incredibly wonderful. It makes me feel so grateful, so inspired, so full of admiration for the enthusiastic Yarn Tribe we belong to. I get to meet so many gorgeous people from all over the world who travel to experience Yarndale and perhaps a little bit to see me too. This year, more than in other years, we did notice an increase in our foreign visitors - when I say from "all over the world" I really do mean it! I met lots of really lovely ladies (and gents) from Australia, New Zealand, America, Canada, Spain, Italy, Belgium, Switzerland, the Netherlands, Portugal, Israel.....yes, honestly! So I get to chat and chat and chat! And of course listen and encourage and celebrate and laugh - it's a full on social whirl. It makes me realise that all these words that I sit and tap away at my laptop each week, all these thoughts and feelings and ideas and images that I share do indeed reach out and touch people far and wide. During Yarndale weekend, I get the real life version of my blog comments in three dimensional full colour, it's as if the whole thing quite literally springs to life in front of my very eyes. It's very humbling, and a rather marvelous experience for someone like me who leads a pretty quiet, quirky life. I am beyond grateful that I am not on my own in this little patch of Yarndale - that very first year in 2013 when I was on my own was almost too much for me to handle by myself. These days I call in the troops! I just love having the Wool Warehouse team with me at Yarndale, they are the loveliest, friendliest bunch and work so hard during the weekend. Thank you to every single one of you who took the time to come and say hello, I can't tell you how much I appreciated it and enjoyed meeting you all. And thank you also to everyone who was inspired by my blankets and took the decision to start out on a new colourful hooky journey. ThAnK YoU, so much, it makes me happy right down to my toes. Of course, it wasn't just blankets and yarn and excitable people that filled my little auction ring, no, no! There were socks too, lots and lots and lots of socks! Just look at them all!! This is Christine's famous "Yarndale Sockline" which was so successful this year that we ran out of space to hang them. This was the third year that Christine organised the sockline for Yarndale, and it is just such a lovely feel-good thing. Knitters were invited to make a pair of socks which will be gifted to those in need of a little bit of woolly comfort and love. Chrsitine says "...in our world where the media likes to focus on what's going wrong, we need to remember that some things are going right. I like to think that when I tell you that the pair of socks that you knitted has gone to, say, a homeless hostel or a children's hospice, you will smile, your heart will smile and that moment of connection will send love and positivity out into a world that needs all the love it can get." Isn't that just something special? If you would like to know more about this year's sockline including the Grand Total of Socks Recieved, hop over to Christine's blog for a read. For me, Yarndale weekend is so many things. It is the culmination of almost a year of planning, creating and working. It is a celebration, a gathering of like-minded souls, a joyful, yarn filled festival full of talent, passion, excitement, friendship, creativity and inspiration. It is a time when we all feel that we Belong to something absolutely, crazy-wonderful. I took the above picture at 9.30am on Saturday morning, in that surreal window of time when everything is poised and ready to go, and we are just waiting for the doors to open. It's like the lull before the whirlwind! Our exhibitors work so hard to transform their bare concrete and metal pens into beautiful, enticing little showcases and shopfronts, they really do us proud. Sadly, I don't get much of a chance to look around - that's one thing I would love to change about my own Yarndale experience. I did manage to have a quick squizzy early on Sunday morning, and so had a few photos on my camera, if you'd like to see what caught my eye? There is such a huge range of beautiful things to see, squish, stroke and admire. Yarndale is very, very much more than simply a yarn show. I also wanted to share the above images which I came across on Instagram - I think they are absolutely wonderful. Lisa is a textile artist and her eye for detail (and photography) is incredible. She described her experience of Yarndale as "a game of 2 halves...the natural neutrals and the bright Zappy colours"
So that's Yarndale over for another year - the fifth festival and what a success it was. 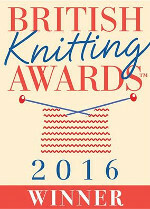 Last week we received the news that Yarndale came 1st in the "Best Knitting Event" category of the British Knitting and Crochet Awards 2017, for the second year running. We are so proud of what we've created, and the feel-good that it brings to our visitors, exhibitors, and of course the lovely little rural market town in which we live. Thank you ever so much for reading, I hope I haven't been too long winded and that you've enjoyed a little bit of a peek behind the scenes. ps I'll keep you updated on the Creatve Hearts - I'm hoping to have all the image galleries ready to publish next week. amazing post lucy, keep it up! Thank you for sharing Yarndale with those of us not lucky enough to have experienced it in person! It really sounds like such an amazing experience and I WILL make it there one day!!!! Well done - I know you put in such a lot of time and effort but it always looks like it pays off! Thanks from me, too, Lucy, for sharing so much from Yarndale. It was almost like being there and then looking at one's photos afterwards (only they are your photos LOL). So inspiring to see glimpses of so many people's work. I love all the yarnbombing, too. What fun! Yarndale is on my own list of things to do. Love and blessings and a million thanks to all involved. Congratulations on another labor of love! because it is your love for this art that has grown into such a beautiful and delightful event! I always find it a bit sad (blended in with quite a great deal of happiness) for you that you are so busy at the event that you don't fully get to experience the other exhibitors the way the 8500 attendees do. When I've been part of events, fairs, house tours, etc in the past we have designated an "exhibitors hour" lack for a better all around term. An hour or two is set aside for those who are exhibiting or docenting or volunteering etc at the event to have private time to visit the event themselves. Consider designating an hour or two sometime during the event when it is closed to attendees and open only to exhibitors and volunteers... just an idea! One day, I'd like to attend, until then I always enjoy the reports of those who did. I just loved the granny sheep tote bag. Had to have one, even though postage to the US is as much as the bag itself. But I'll have a bit of Yarndale to enjoy, along with your blog and Winwick Mum's, since I'm not likely to ever get there in person! Lovely blog as usual and wonderful pictures. I really look forward to your blog, you have inspired me to learn crochet, I'm on the third stripy bag and have just finished your hydrangea blanket, all much admired by friends and family. Only problem is deciding which blanket to make next! Thank you. Oh my Lucy your incredible detail of the show not only brings back such a wonderful trip which I am sure I will miss next year and OH even said are you sure you don't want to go back for visit number 6!! But how to write a blog in such amazing detail. While I am loving starting my blog journey again, I am struggling to find "interesting" words to write. So pleased you are back on form Lucy I could read your blog all day every day it is so inspiring. Yarndale is definatly on the to do list. Umm just had a thought perhaps I could get a group of us together that would be exciting. Need to work on that one. What a fantastic blog post! Both writing and pictures - glorious. Thanks for taking the time to write it! Wonderful post Lucy it made me feel as though I was there. Hope to make it next year. Fabulous post Lucy can you direct me to suppliers of huge wooden crochet hooks and very thick yarn picture in your post suitable for throw blankets having difficulty finding this yarn in Australia. Thanks in anticipation. Lucy, I've just discovered your blog and it is truly lovely! I am new to crochet and always looking for ways to learn and inspiration. I have searched the site and Facebook for a way to reach you, even emailed the retail shop. They suggested I leave a comment here. I run a small business and have an inquiry about the blog. I'd love to hear from you! Bravo! The fifth already?! Seems like yesterday the first year was planned. Makes me want to go more and more. Glad you are feeling a little more tip top! Golly is it 5 years already???? I came along to Yarndale#1 and life has conspired to prevent a repeat visit. Maybe I should just take the plunge and book tickets for 2018 right now!!!!!! How awesome! You did a wonderful blog post with pics, on this beautiful Yarndale weekend event! All I can say is - Wow! The hard work to bring this all together is amazing! Thank you for sharing, Lucy!! Thank you for this wonderful post Lucy - special thanks from the likes of me who were disappointed at not being able to get there. No wonder Skipton has been voted the happiest place to live!